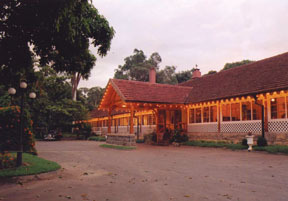 The Bandarawela Hotel where the old order of traditional hospitality still holds good. Lovers of the fascinating fauna and flora of the hill country are assured of the added bonus of the panorama of undulating emerald tea-covered hills as they roll around cascading waterfalls and jungle areas which cradle to its bosom legendary and historical treasures of Sri Lanka, a spokesman for the hotel said. He said the Uva Province is steeped in history and boasts of probably the most pleasing climatic conditions in the island and what more would you need to provide the right ambience for a real R&R but a visit to the Bandarawela Hotel where the old order of traditional hospitality still holds good and is guaranteed to please the most exacting guest! Bandarawela Hotel is a legendary monument which has managed to retain its dignity and old fashioned charm in times of high technology and surface values. Adjacent to the Hotel is The Bandarawela Tennis Club, around which was the hub of life in this town in its heyday. They still work very closely together and you will find your recreational pursuits catered to. He said giving due recognition to the needs of the times, Bandarawela Hotel now provides a Board Room for business executives to meet and carry on their activities even while away from the office. This is the ideal place for a gathering of Executives or Directors to hold a residential or one-day seminar or conference. From ancient times to the modern day, Bandarawela Hotel also used to be the favourite haunt of varied legendary giants such as ex-President J. R. Jayewardene and Leonard Woolf found the whole experience absolutely fascinating and the Village in the Jungle, a timeless classic and we can guess where he got his inspiration from; he said. This colonial hotel is under the management of Aitken Spence Hotels. Aitken Spence Hotels, a subsidiary of the Aitken Spence Group, have consistently strived to maintain the heritage and integrity of their hotel investments and enhance the natural surroundings of each area, via a chain of hotels under ownership and management in Sri Lanka and the Maldives. Emirates Airline's inflight entertainment has received a resounding customer ovation by securing the "Best Inflight Entertainment" award at the recent Skytrax 2006 World Airline Awards. This is the second successive year that Emirates has been chosen for the accolade, based on results of the Airline Inflight Entertainment Survey commissioned and conducted by Skytrax Research of London. This award maintains Emirates' global leadership in the inflight entertainment category. Divisional Senior Vice President Corporate Communications, Emirates, Mike Simon said; "It is a great honour to be voted number one at the World Airline Awards again, particularly because it comes directly from our discerning customers. "We continue to implement enhancements to our inflight entertainment services, ensuring that we exceed our passengers' expectations," he said. The survey results highlight that inflight entertainment quality is now a highly influential factor in customer evaluation of the overall travel experience. The importance of inflight entertainment to the typical long-haul passenger is a feature that carries increasing weight in airline choice. 'A ravishing Ravioli promotion' will be held at The Bay Leaf at Gregory's Road Colombo 7 from July 1-10. The selection includes traditional favourites and exqu- isite varieties specially created for this promotion. The promotion includes an array of delights, stuffings of spinach and Ricotta, lobster, Fresh Salmon and many more. A delectable sauce of your choice - Quatro Formagi, Tomato Cream Vodka and Origano or perhaps Pormadoro and Pesto awaits you. All this can be savoured in the friendly atmosphere of The Bay Leaf where the snazzy Bar is always inviting. A complimentary glass of Italian wine will be given with every home made dish of Ravioli ordered. The Bay Leaf is managed and operated by Harpo Productions (Pvt) Ltd.
Country Manager - Sri Lanka, Air Arabia, Mayank Dhingra at the opening. Managing Director, Traveller Global (Pvt) Ltd Rizmi Reyal looks on. 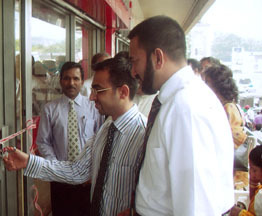 Air Arabia LLC opened its branded sales shop in Kurunegala. The shop is the first outside Colombo for the airline and has been opened in partnership with Traveller Global (Pvt) Limited. Air Arabia's Sales Manager, Ramly Vilcassim said, "We are delighted to announce our presence in this important district. Kurunegala and the adjoining towns have had a tradition of large movement towards the Middle East and with our extensive network in the Gulf region we have become the airline of choice for them. It was the logical next step for us to open our office here and facilitate our loyal customers further". Managing Director, Traveller Global Rizmi Reyal said. "We are very pleased with this new tie up with Air Arabia which not only further strengthens our relationship with them but also with our trade partners in Kurunegala. We are well known for our service levels and our customers' stand to greatly benefit with this new initiative."